In my dream I am sitting on a plank that I have placed so that it straddles a large hole I have dug in the sand. I am in the process of burying men in the sand. I know that they will probably die, but I don’t mind because they are bad men. An important part of any dream interpretation is to isolate the symbols and then give the dreamer a neutral prompt that will encourage her to describe each one. Here are her replies to that “Tell me about it!” prompt. Plank: It’s really a kind of scaffolding I’m using to keep me from falling into the hole. Straddle: That’s how I’m able to stay above the hole. Large hole: Well, I guess I’ve basically dug a grave. Sand: Lifeless—nothing will grow in it. Unstable—it blows around all over. 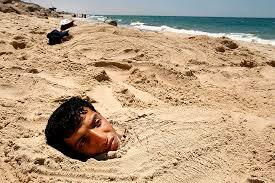 Burying men: Getting rid of them so they won’t bother me anymore and will just disappear. Dying: Losing life, ceasing to exist. Don’t mind: I’m untroubled. I have no qualms. Bad men: I don’t really know what these guys have done to me; I just know they’re not good for me. There’s a part of me that I’ve made into a kind of scaffolding to keep me from falling into a hole inside myself. I use this part of me to stay above the hole in me. I guess what I’ve done is to dig a grave inside myself. It’s in a part of me that’s lifeless; nothing will grow in it. This part of me is unstable and blows all over. There are other parts of me that I know are not good for me. I don’t really know what they’ve done to me, but I’m getting rid of them so they won’t bother me anymore. These parts of me are probably going to lose their lives. They’ll cease to exist. I’m untroubled by all this; I have no qualms. As is nearly always the case with dreams, when they are retold in this fashion, a set of bizarre, implausible symbols transforms itself into a clear, pointed message. But in this case, there are two possible meanings—one far more reassuring to the dreamer than the other. With her help, we’ll take a close look at both possibilities in my next post. Stay tuned! If you enjoy these posts, you can follow the discussion without interruption.